Alex : Today we have two special guests who are joining us from the University of North Carolina at Chapel Hill. They're both in Emergency Medicine. We have Brooke Namboodri and we have Tim Platts-Mills. Welcome to the GeriPal Podcast, Brooke and Tim. Brooke : Hey guys, thanks so much for having us. Eric : So we're going to be talking about your new article in the Journal of American Geriatric Society, or JAGS, on "Elder abuse identification in the prehospital setting, an examination of state EMS protocols." But before we go into that, we always ask our guests if they have a song request for Alex. Tim : Oh, yeah, if you could play "Old Man" by Neil Young, that would really warm my heart, and my daughters would also appreciate that. Alex : We're going to give it a try here. I'm just going to play a little snippet at the beginning, and the rest will be at the end of the podcast. Eric : You just learned that one this morning, didn't you? Alex : I just learned that one in the last ten minutes. Eric : Alex actually had financial abuse committed to him. Alex : I was the victim of abuse this morning. I got a call from a collection agency saying I owed Sprint $5,000. And fortunately, I had the means and wherewithal to call the police, track this down, go to the Sprint store all before this podcast this morning. I actually got off the phone with the police because I said, "I have to go to work." I did not say, "I have to go learn a song and get on a podcast." Alex : You see, priorities. Alex : But other, older adults do not have the ... you know, many of them are victims of elder abuse of one form or another, including financial abuse, very common. And that's what we're going to talk with Brooke and Tim about today. Eric : So many before we get into your JAGS paper that was just published, how did you both get interested in this subject of elder abuse? Tim : I might try to take that on. So, I've been interested in the care of older adults in the emergency department for about eight or nine years, and I mentored a woman named Tarshona Stevens about six years ago. And she wanted to do a project, we sort of decided we'd do a project on the non-medical problems faced by older adults and we got a little bit of data on elder abuse as part of that. And we found that seven percent of older adults reported elder ... in the emergency department, reported elder abuse in the past year. And then my mentor, Sam McLean, who has a lot of funding to do ... has an R01 to look at persistent pain after a sexual assault, met with somebody with NIJ named Carrie Mulford. I got connected to Carrie, and that let to both funding from NIJ. We submitted for a grant, and received funding to develop an emergency department based screener. And so we're sort of in the space of elder abuse. It was a sort of a twisted route, but that's how it goes. Alex : And when you think about elder abuse in the emergency ... so how did you transition from thinking about elder abuse in the emergency department to thinking about it in the prehospital setting? Brooke : Yeah, great. So, we saw that elder abuse was this pretty common condition that older adults were coming into the emergency department with. However, a lot of these emergency physicians aren't able to see some of those observations that EMS providers can so readily see when they visit a patient in their home environment. They're able to see how the condition is with their home, are they taking ... you know, are there empty medication bottles lying around. What are their interactions with their caregivers, in this often unexpected medical condition that shows up. So we kind of saw an opportunity with EMS providers to act as someone who can implement a screen in the prehospital setting in order to identify victims of elder abuse. So we saw kind of a partnership between emergency providers and EMS providers as a great next step for identifying elder abuse. Alex : And some of this ... you know, you make the point that we need ... it's so helpful to have the eyes and ears in the homes of older adults who might pick up on elder abuse, but I think the other point you're making is that often they're not called in for the elder abuse itself, is that right? And that this is incidentally either discovered by prehospital providers, or reported in the emergency department, though it may not be the presenting issue at hand. Brooke : Right, exactly. A lot of these older adults are coming in for some ... you know, for a fall, or some other condition. And then they're, like you said incidentally finding elder abuse, that they've experienced elder abuse in some way, shape or form. So we're hoping that EMS providers can kind of fill that gap of being another set of eyes and ears directly in the patient home, to validify if these patients have actually experienced elder abuse and what that abuse looks like for those patients. Tim : The point I would make is that in contrast to child abuse or domestic violence, where a lot of times there are clinical findings that are pretty obvious that are causing the patient to come to the emergency department. Like the patient has a black eye, comes into the emergency department after getting hit by their boyfriend, let's say. That's not so hard to figure out. But in elder abuse, a lot of times it's not staring you right in the face. It's a little bit below the radar. It's still present, it's still really hard on the patient, and has a lot of consequences for health outcomes, but it's a little more subtle. So yeah, as you're saying, it's not necessarily the chief complaint that brings them in, but it's there for sure. Eric : Do we have any data on how often it's actually picked up by EMS or by emergency medicine physicians? Brooke : So there's no data specifically about EMS providers, however, there's just a dearth of data in this area in general. However, we do know that about less than five percent of all cases are reported to the authorities, whether that be from an emergency provider, another kind of provider. It is about less than five percent, which is a pretty ghastly number. Alex : And you know, just to pick up on this point about using prehospital EMS providers for this service, it's not actually what they were designed to do, as far as I understand. Like, they are the first responders for emergencies, but this is really asking them to fulfill a public health mission at the same time of screening the elderly population for elder abuse. Brooke : Yeah, that's a great point. Actually, EMS roles have begun to kind of develop into being some of these people that are able to go into people's homes and identify social problems like elder abuse. A lot of these programs are that people are naming community paramedicine programs for EMS are coming into homes and identifying social problems beyond elder abuse. Some things like malnutrition, heating, and they're acting kind of in that social worker role. And doing things like health preventative, and checking up on patients who were discharged from the emergency department, and need help with taking their medications and stuff. So, we're hoping that as that role evolves, that we can identify elder abuse as a really important next step to bring into that role for EMS providers. Tim : I would add that the mind of the emergency position is gradually evolving on the issue of the role of the emergency department in public health. And I think we've come a long way. I think a more traditional view is like, hey, we just deal with the emergency issue. But of course, we update people's tetanus even though they don't have tetanus, so that's kind of public health role. And oh yeah, it turns out that if you want to deal with the HIV epidemic, you should probably be screening for HIV in the emergency department. Because some of those high-risk people are only really contacting the ED. And so, there are places which we see, oh, in emergency medicine and in prehospital care, there are these public health roles that frankly, you can't deal with those problems except by leveraging the opportunity of the emergency department visit. Brooke : And even more than that actually, in studies that have surveyed the EMS providers to kind of assess their willingness to do things like that, EMS providers overwhelmingly say that they not only identify some of these cases of elder abuse or social problems in a prehospital setting, but they really want to do something about it. So like Tim was saying, this is a role that is evolving, and something that EMS providers are really ready to take on. Eric : So, that kind of leads us to your study describing whether or not there are protocols relating to the identification, management, and reporting of elder abuse in EMS protocols. Do you want to tell us a little bit about what you did? Brooke : Right. So for this study, we examined publicly available state-wide EMS protocols and other accompanying documents like system protocols, procedures, and guidelines. So we really tried to limit the search to documents that were specifically intended for and available to EMS providers. So we searched these documents via three different ways. There was an appendix of a paper that looked at EMS protocols. It was by an author Kupas And then, we looked at emsprotocols.org, and then also each state's public health website. So essentially we went and looked at all 50 states and tried to find any publicly available EMS protocol that was out there. More specifically, these protocols are written mostly for BLS providers, which is the Basic Life Support, or Advanced Life Support. And we were really willing to kind of take either of those ... either document because ultimately we didn't really care if it was a ... the level of training that these EMS providers had, as long as they were able to identify elder abuse. And then after we were able to identify each of these protocols, we searched the protocols for terms like abuse, neglect, mistreatment, and looked for the associated qualifiers, like elder, senior, geriatric. And then tried to identify protocols that A, mentioned elder abuse, defined elder abuse, listed any indicators of elder abuse, so a things like bruises, or fractures, those physical indicators, or psycho-social indicators like they're not making eye contact with their caregiver, or environmental indicators like the house is cluttered. And then we also looked to see if the protocol described patient management, if they were to identify a patient experiencing elder abuse. And finally if the protocol mentioned about that this elder abuse should be reported, and if it was mandatory in their state or not. Eric : So what did you find? Is it in many protocols? Tim : Yes, so, there are not ... not all 50 states have state-wide protocols. So for example, we're not going to talk a lot of trash about California, because California doesn't have a state-wide protocol, and has basically county based protocols. So but of the 35 states that do have protocols, only 14 mention elder abuse. So you're kind of already less than half even have content in elder abuse. And then if you look in terms of what do they provide. So ten out of 14 give a description of indicators, eight out of 14 describe patient management. The majority of the ones that do, 12 out of 14 provide instructions for reporting. So the minority of states, among states which have state-wide protocols, only like less than half, 40 percent, have protocols which address elder abuse at all. Alex : On its surface, this is really concerning, and probably it is so. But a couple of caveats. One is ... so a state like California where the EMS providers tend to be regionalized rather than state-wide, is that part of the reason that there is no state-wide protocol in California. As opposed to a state like Oregon, where my understanding is they're able to have a POLST registry in Oregon, because they only have one EMS provider for the entire state. Brooke : So I think that how the EMS providers system works really just varies state-by-state based on laws. So I think ultimately it boils down to if the lawmakers decide that EMS protocols should be mandatory state wide, and that every single county should have the same exact protocols. Or if they want to give their counties a little more space to move around and make their own protocols, which is the case of California. This might be influenced how many EMS providers, or how large the state is, and things of that nature. But it is mostly a regulatory issue with the EMS providers, and that's why it just varies so much, state by state, region by region. Alex : You notice how I came to the defense of California there for a second. Tim : I see, I see where you're going with it. I think at the end of the day, there are a lot of protocols out there that don't include elder abuse as a description, and our findings are also consistent with when they've done interviews, qualitative work with paramedics and EMTs and they say, "Hey, how do you feel about identifying elder abuse?" They say, We'd like to, and we see it, but we just don't have any mechanism for describing it, and there's not a clear pathway for reporting it to providers, and the emergency providers will sometimes ignore us. And so I think there really is something that could be improved here. Eric : Do we have any ... if you had to compare this to child abuse, do we have any data on the ... is it similar as far as number of protocols that have information ... like what EMS should do in those circumstances, or what to look for? Brooke : So this was something that we were really interested in as well, and so we a similar ... with a similar mechanism we searched child abuse. We search child abuse in protocols as well. 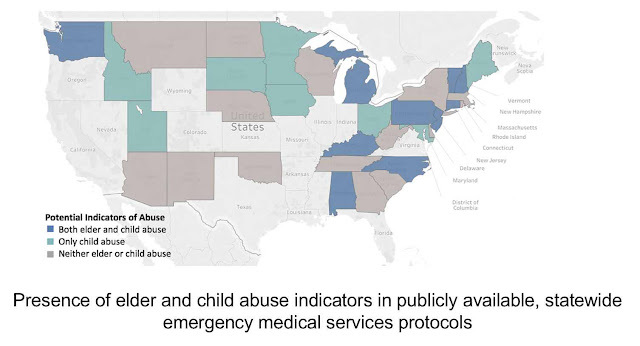 And what we found is that twice as many protocols actually mentioned child abuse, and all those different metrics that we were talking about, defining elder abuse, finding indicators, instructions for management and reporting. There was about twice as many of those metrics found for protocols with regards to child abuse. We hypothesized that this is due to several reasons, one of which is that there's just a lot more research surrounding child abuse. So child abuse is just one of those things that has been talked about a little more frequently for a little longer. And so it's been integrated into these EMS protocols just because it's kind of been out in the open for longer than elder abuse has. And we're hoping that we can kind of forge a similar path with elder abuse that ... follow that pathway for child abuse with elder abuse, since the pathway has kind of been forged. That being said, we were shocked that not every protocol mentioned child abuse. So there were only 80 percent protocols that mentioned child abuse at all. And the fact that 20 percent of these protocols that we were able to find didn't mention child abuse I think demonstrates that there's still a lack of fully understanding abuse, and how to identify it, and how to really leverage the role of EMS providers in identifying any kind of abuse in the prehospital setting. Alex : You know, backing up a moment, I think should talk about why are we talking about protocols? Why can't they just tell the EMS ... why the EMS providers just say, "Hey, guess what I saw in the home setting?" I think, Tim, you alluded it to somewhat, just a moment ago, protocols are the way in which, the structured way in which this information is transferred, but why this emphasis on protocols? Tim : That's a good question. The truth is, if it's not in the protocol, it doesn't technically keep an EMS provider from doing it. And so they're certainly ... there are states, for example, Idaho doesn't have a protocol when we searched. As of the time that we searched, their state protocol doesn't talk about elder abuse. But there are certainly EMS providers who recognize elder abuse and tell EMS, and the emergency physicians about it. So it's not just, like absolutely ... you know, if the protocol is there it happens, and if the protocol is not there it doesn't happen. However, the protocol really does support the activity. And EMS is a very protocol driven system, so basically, the response to every paramedic or prehospital provider is just do what the protocol says. That's always the answer. And so, if the protocol's there and supports it, it becomes sort of like a behavior that they can do, and it's clear what are the next steps, what additional information they should be collecting in the field. And then it's also better supported in terms of communicating with physicians. And I kind of mentioned this earlier, but if you ask paramedics, they will say that they often feel obstructed in trying to report this information to emergency physicians. And it's not, you know, the protocols don't completely solve that, but I think would solve that to some degree. Eric : So it sounds like there's a potential path forward looking at child abuse protocols, and it sounds like EMS is not only willing but eager to actually have this as part of their job. What's the next step? Where do we go from here? Tim : Well, our hope is that this article and the related work that's going on in the field of elder abuse will raise awareness by medical directors of EMS systems to change protocols. But it's a little heavy handed to say, "Well, your protocol doesn't have it, and we think it should, and so put it in there." Because the obvious response would be, "Well, what's the data that this is actually the right thing to do?" Now, you and I might agree, well, it seems like the right thing to do. But if you look at the US Preventative Services Task Force recommendations on elder abuse, it doesn't even support screening for elder abuse, basically, in any setting, or in primary care, which is really what it's focused on. Because there's no data to support it. So, there's really like ... the research field is really kind of a little bit behind in terms of developing, A, what are the screening tools and instruments in the prehospital setting, and then, B, what's the evidence that this is actually helping patient outcomes? So there's a lot of actual work to do. Now I personally don't think we should wait for all that research to be done to go ahead and put those protocols in place, and try to develop the capacity of prehospital providers to identify elder abuse. But unfortunately there's still a lot more work to be done. Brooke : To add on to that, I think on a day-to-day basis, there's things that providers can do, and I think one of those things is really just to listen to what EMS providers come in and say to them. Even with the health care structured protocols screenings in place, EMS providers are most likely identifying some of these things that we're hoping they're identifying. You know, like a cluttered house, or those medication pills everywhere, or a caregiver who's intoxicated. And making those mental notes is really important, and something that if they just are able to communicate to the ED providers would be really big. If you facilitate that conversation, and that exchange of information, you start to get another layer of providers looking at elder abuse, and you know, is that person possibly experiencing that. So I think opening that line of communication is something that on a day-to-day basis ED providers can do to start to identify this elder abuse more and more. Eric : Are emergency providers mandatory reporters of elder abuse if they hear about such concerns from prehospital EMS providers? Tim : In every state except New York, which does not ... New York does not have mandatory reporting, but all other states, yes. So any medical personnel who gets that information is a mandatory reporter. The actual definition of elder abuse in most states is somewhat restrictive. So it has ... basically in North Carolina, in order to be elder abuse, the person has to be dependent on other people. So for example, if my mom and my dad weren't getting along very well, and they fought, it wouldn't count as elder abuse, because neither of them are dependent in any formal sense. They may be psychologically dependent on each other in a nice way, but they're not formally ... you know, they're not dependent on each other. And so that would be domestic violence, and that wouldn't fall under mandatory reporting. But if somebody's dependent, like they have difficulty walking, they can't meet their basic needs, or they have cognitive impairment, and there's abuse, then there is mandatory reporting, except in New York. Tim : If Alex was 70 years old but kind of did everything he normally does, then no, it probably wouldn't technically be elder abuse, it might be a crime, but it wouldn't fall under that. Brooke : Now, if one of his children, or someone who was taking care of him, had done that, then it most likely would fall under elder abuse. Eric : So you're saying if it was his cohost on a podcast who bought a bunch of iPhones. Alex : You stole $5000. Eric : I just want to make sure. Alex : Yeah, I came in and said that to Eric, and he said, "oh, hey, I just got five new iPhone X’s from Sprint at my house." Great. Eric : So I've got a last question. We've talked a lot about screening, and the potential use for screening, and Tim, you also mentioned that there's not a lot of great research out there on really effective screening tools. What do you guys recommend as far as potential screening tools for elder abuse? Tim : Well, there is the ED Senior Aid Tool, which is submitted for publication as just described by our group. So I'm being a little bit funny, because that is work that we're working on. But I think, let me rather than answer with that, let me see more broadly. I think in the emergency department, a couple principles apply. One is, you really need to screening everybody. Because if you just think, "Oh, I'm going to get the people who have bruises on their arms," you're just going to miss almost everybody. The prevalence of elder abuse in the population is like, 10 percent amongst older adults. So it's really common. So we should screening, I think, universally. How you do that best is not entirely clear, but it's probably going to be some combination of a cognitive assessment, some really ... a really limited number of questions, because you just can't do a big battery of questions for every older adults who comes in the ED. They're not going to tolerate it, and the nurses or whoever's doing it won't do it. So it needs to be really efficient and limited, and then it needs to be more expansive for people for whom there are red flags. So if the patient has cognitive impairment, or answers yes, or refuses to answer a question then you need to take a deeper dive. And we've tried our screen on 250 people, and we've found like 17 cases. And that was among consenting older adults. So we think ... you know, for methodologic reasons we had to get consent. So I think that's an underestimate. That gave us a prevalence of around seven percent. I think the exact tool is sort of up in the air. There are a couple published versions, none of which we think are optimal for the emergency department. But we think it's definitely something that we can ... that's a nut that we can crack, and we can come up with a good tool for the emergency department. Brooke : And to translate the tool that Tim is talking about, to the prehospital setting, we're really hoping that it becomes more observation based as well. As we were talking about, I think something unique about the EMS provider role is that they are actually going into these patient's houses, and they're able to see the actual condition these patients are living in. And so building in some of these observations into that screening tool is another really valuable part of the screen that we would like to add in. Tim : Eric, if I could add one other thing, I would like to add thanks to the National Institute of Justice for the support of and funding of our work to develop the screening tool. They didn't fund this particular project per se, but they have supported the Senior Aids tool. The people at NIJ don't ... this work, we're not speaking on behalf of the NIJ in any means. They are funding the work that we're doing. And I'd also like to thank some of the collaborators on the project, including Sheryl Zimmerman, Sheryl Zimmerman and Bryce Reed, for both have been extremely helpful. Eric : Alright, are there any other things that you guys would like to talk about, about this paper, or anything else that we should, before we close? Tim : No, I think I would just echo, we're emergency physicians, but I see us as having kind of strong partnerships with the geriatricians, and we're thankful for that. Brooke mentioned that it's important for emergency physicians to be sort of listening and open to comments from emergency ... from the prehospital providers, and I think that geriatricians likewise there are parallels there in the in-patient setting, for like, listening to nurses who pick up on stuff. I mean I think this is ... I think elder abuse is something that takes a village to solve. And so it's important for us to be good village members, and good listeners, and consider it a team approach. In some cases, in our system, we've had geriatricians help solve cases for us where we didn't really pick it up, and then they get admitted, and then we find out, oh, they're a bunch of patients from a nursing home, and they all had the same problem, and the geriatrician's the one who figured it out. So it's very much a two way street between emergency physicians and geriatricians in that regard. Eric : Wonderful. Well with that, we'll maybe do a little bit more of a closing with Alex singing more of Neil Young, but before we do that I just want to say thank you for joining us on this podcast. It was great talking about this. Alex : Thank you so much, it's a very important issue, and I learned quite a bit about the role of EMS providers in public health, and screening for elder abuse in particular. Thank you so much. Brooke : Thanks so much for having us. Eric : Thanks everybody for listening to our GeriPal podcast. Stay tuned next week for our next podcast.